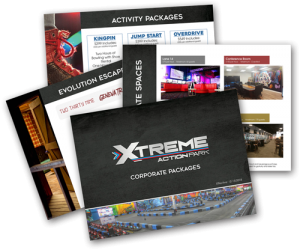 These are just a sampling of our most popular small group packages. They are best for gatherings with 10-25 drivers. But remember, we can customize your event to fit any budget! Some of the benefits of booking an event in advance include the ability to reserve a date and time that is convenient for you. Plus an event coordinator the day of your event to meet your team. And the option to customize packages with our many add-ons, catering options and full liquor bar menu. For larger groups, please complete the online request form and an event coordinator will assist you. Package priced for 10 guests. Additional guests can be added for $30 per person. Package priced for 10 guests. Additional guests can be added for $40 per person. Package priced for 10 guests. Additional guests can be added for $55 per person. Available Monday to Friday only. Package price per 10 guests. Subject to sales tax and gratuity. Package offers subject to change at any time, without notice. Call Event Planner for full details. Package priced for 10 guests. Additional guests can be added individually for $40 per person. Add our custom Trophy Package for $35. Lap Race Requirements: All Drivers must be 16 years or older and minimum 62” tall to participate. Pro Karts only. Learn more about Lap Races vs. Timed Race Sessions. Geneva Trail & Dine in at Dusk are maximum 10 guests. Two Thirty Nine is maximum 6 guests. Private Track Rentals are great for groups. Your group will receive a safety briefing before entering the track. The track is rented out for a selected amount of time (30 minutes, 45 minutes or hourly intervals). Races will then be run at pre-selected intervals determined by the Event Coordinator based on the size of the group. Participants are divided into teams of 3-5 people. Everyone must participate in some way. The length of the race is based on the amount of participants and the number of teams created. 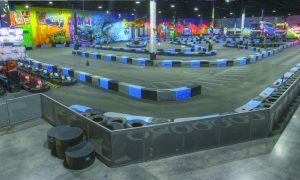 There are usually qualifying laps before the race begins to determine the order of the karts as they enter the track, the lowest scoring racers first down to the highest. Groups must use teamwork, strong communication, and creative problem solving. Remember, most races are lost while conducting “Pit Stops” and switching drivers. Teams must determine the driving order, how they are going to divide track time, as well as how they will prepare for the pit stops. Those who don’t wish to race can assist with organization which is a vital role in any team race. The team who finishes the designated lap’s first wins and the race is over. For an added bonus, your company’s logo can be displayed on our full size digital board overlooking the track for the duration of your event. Optional 1st, 2nd and 3rd place personalized trophies may be awarded.